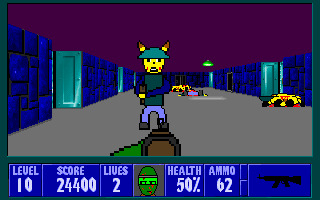 It's a Wolfenstein 3D mod starring Lizardcommando and he's on a mission to stop two evil dictators, Ash and Pikachu from taking over the world with their army of genetically enhanced Pokemon. Before I see people saying "OMG! Pokey-man!??! LOLWTF?!? TEH GHEY!" I'd like to say that this mod is not about senseless and tasteless killing of these critters. I'd say that it's Pokemon killing done in a tasteful manner. Eventually all of the 6 episodes from Wolfenstein will be changed. There will be new guns and a new enemy. There is a 1 episode demo available on my site (and here as well). Also on my site are some screenshots, some enemy pics, some more detailed information about the mod, and even a Flash intro. As of right now, I am in desperate need of a Coder. I need someone to code in three new guns, new ammotypes, and a new enemy. Also the coding needs to be cleaned up as well. If anyone wants to help with the coding, please email me at lizardcommando(AT)gmail.com. Maps are slowly being made. I'm halfway done with the maps for all of Episode 2. Eventually, I hope to release a 3 Episode demo later. When? I'm not too sure. I don't want to get everyone's hopes too high. As soon as I can get someone to help with the coding, then progres will definately be sped up. I want this mod to feel new, yet still have the same feel as the classic Wolfenstein 3D game. Most textures will stay the same, but of course, there will be some slight changes here and there. Same goes fo most of the static sprites. I finally got my act together and finished up the last two levels for Episode 2 of Pokestein 3D. Of course, I'm far from being done with my mod as there is still the matter of fixing the source code. Also, as of right now, I need a coder who can help clean up the source code and also help code in three new guns and a new enemy. Please, if you can help with the coding, email me at lizardcommando(AT)gmail.com! The sooner I can get a coder, the sooner a 3 episode demo can be released and of course, the release of the full version as well!